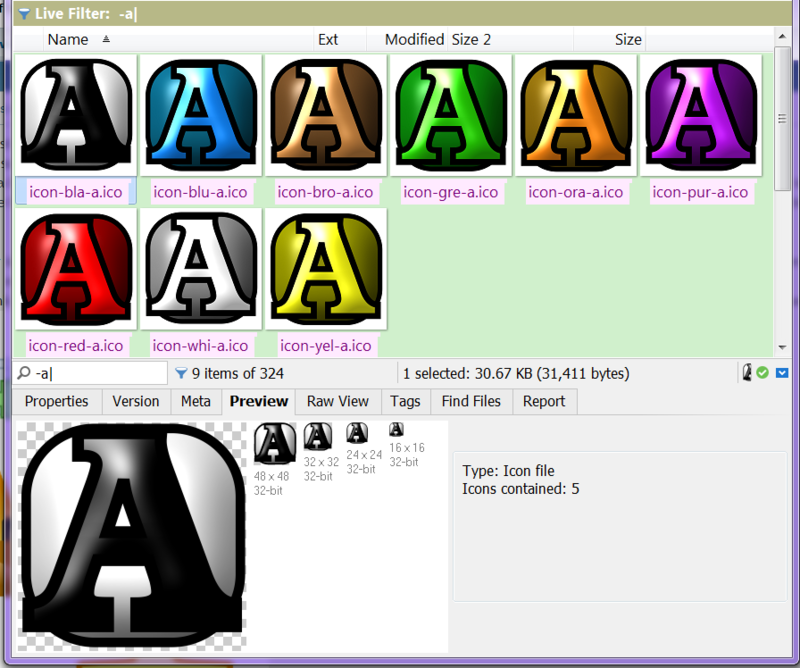 I made some alphanumeric icons for the Custom Icons feature in XY. They're not the greatest thing ever--but I thought I'd share anyway. 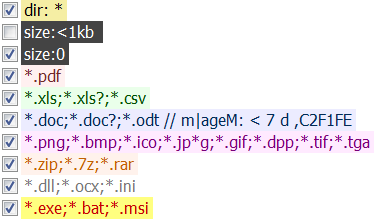 At first I only had red, white, blue, and green, to correspond with PDF, TXT, XLS and DOC, but then I added more colors. Find the Custom Icons button (a smiley). 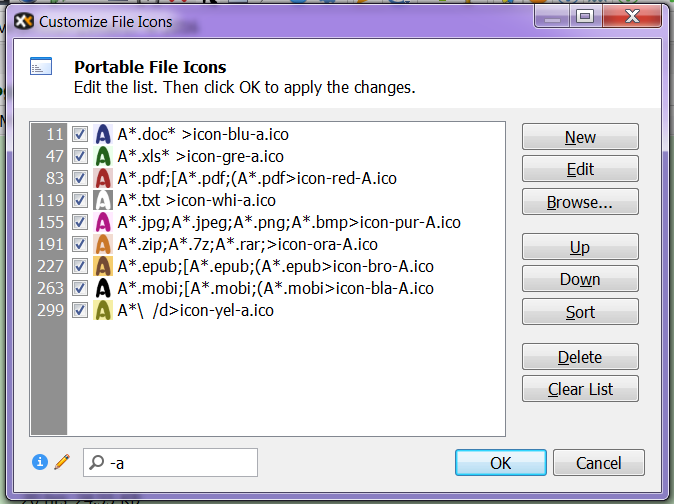 Once it's on your toolbar, right-click it and choose "Go to icons folder." 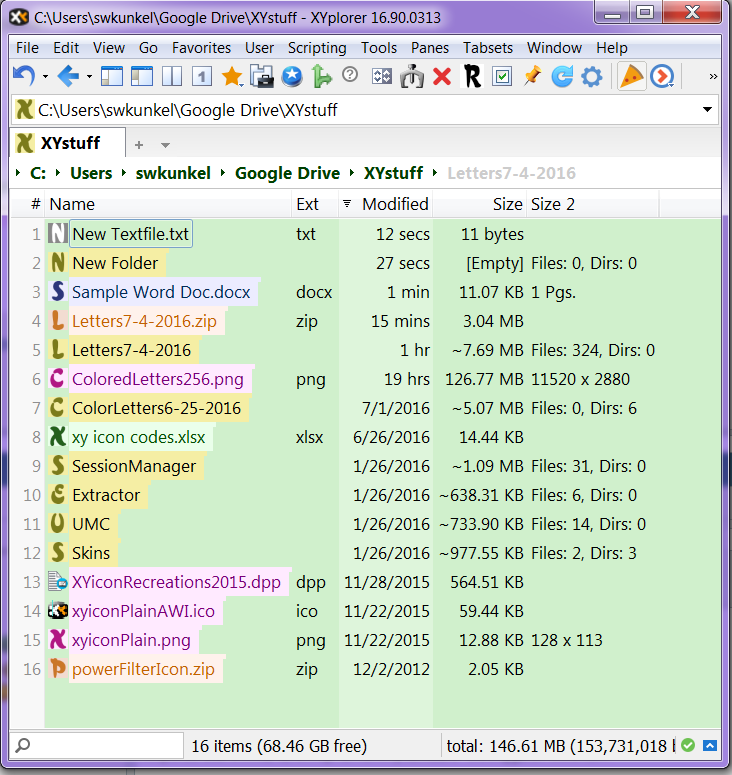 Unzip the icons and take them out of the "forXYfolks" folder... Put them in the XYplorer/Icons folder. 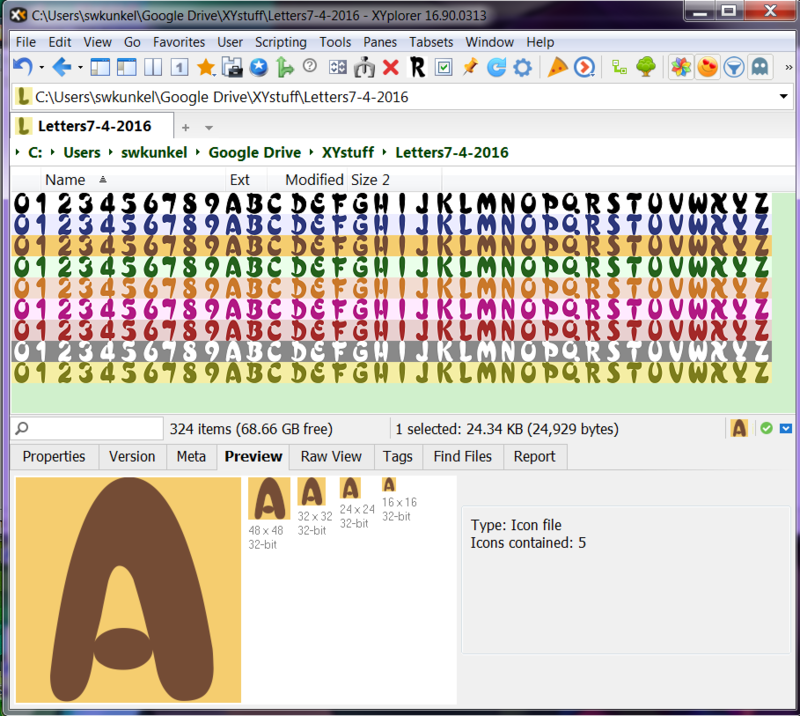 Right-click on the smiley again and choose "Customize File Icons." The little pencil icon in the lower-left is for "Editor Mode." From Editor mode you can copy-n-paste the above definitions..
Last edited by kunkel321 on 06 Jul 2016 01:15, edited 2 times in total. Reworked those custom icons... I like them better now. I removed the backgrounds so they have less of an "iconny" feel to them, but I think they are easier to discern. I also culled out the low-bit images from the ICOs. This made the size smaller, so I was able to attach them directly to this post. Thanks kunkel321, they look great - all the right sizes and transparent backgrounds! Yep, they sure will become useful one day, thanks! Just letters and numbers in different colors. 0-9 and A-Z, no lowercase. At 16pix, they look sortof metallic, I think. Apparently they evolved back to the simplistic look. Screenshot of the simplistic beauty that is "Colored Letters 7-4-2016." Edit: Screenshot of patterns and tiny code block. Do these icons fall under drugs? /off-topic: Don, thoughts on how much work it would take to add regex CFI patterns and how that might impact performance? I think there's a few of us that would benefit greatly from being able to use capture groups in the pattern and reference them in the icon source. For example, kunkel321's list of 324 definitions could be reduced to just 9 which would be much easier to maintain. admin wrote: Do these icons fall under drugs? TheQwerty wrote: /off-topic: Don, thoughts on how much work it would take to add regex CFI patterns and how that might impact performance? I think there's a few of us that would benefit greatly from being able to use capture groups in the pattern and reference them in the icon source. For example, kunkel321's list of 324 definitions could be reduced to just 9 which would be much easier to maintain. I was also thinking of this, while updating my PDF, Mobi, and Epub definitions. I hadn't even thought about capturing the [0-9][A-Z] for use though! EDIT: Just an interesting side note: You'll notice that the 0 (zero) and O (oh) look (nearly?) identical. The I (eye) could also be used as a 1 (one). I make the icon definitions in Excel though, and the images are a bulk job--so it just turns out to be easier to do all 36 characters.. .
kunkel321 wrote: I make the icon definitions in Excel though, and the images are a bulk job--so it just turns out to be easier to do all 36 characters.. . I figured (at least hoped) you weren't typing each of these entries separately! Though right after posting I realized the CFI list is one of the ones Don has blessed with easy script access via the setIcons SC, so we can improve managing the list. Unfortunately, my list is already generated so the necessary effort doesn't seem worth it right now. TheQwerty wrote: /off-topic: Don, thoughts on how much work it would take to add regex CFI patterns and how that might impact performance? I think it should be okay performance-wise. +1 on regex CFI patterns.